Combs Honey Farm, is a small-production apiary located in North Bend, WA. We produce all-natural treatment-free honey and bee products. 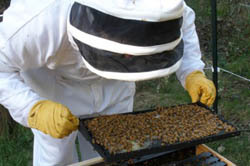 CHF produces several varieties of honey in various forms. More information on the honey page. CSA contracts are now available for the 2014 season. More . . .
Honey bee swarm collection in the Snoqualmie Valley.